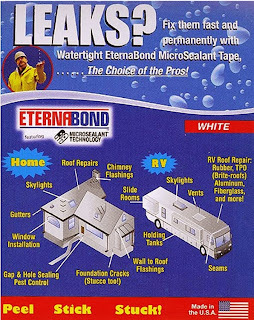 As you contemplate the upcoming RV season, possibly deciding what to include in your storage bays for emergency repairs, be sure to include Eternabond RV Leak Repair Tape. As many of us road warriors know, there is nothing worse than being out on the road with a leaky roof. Having the right tools for the job can make your trip unforgettable - in a good way. Eternabond As-2-50 AlumiBond: This extra tough 2" X 50" roll can repair leaking roofs in a jiffy. It offers 4 mils of aluminum with UV replant that can be painted the color of your choice. The backing is so durable, it has been proven to withstand UV abuse for over 16 years. The patented backing material includes an integrated primer which forms a nearly indestructible, permanent, water tight seal to metal surfaces. AlumiBond is Abrasive and corrosion resistant. Basic uses include: roof repair, siding repair, ductwork repair, drain pipe repair, boat repair, and canoe repair. Eternabond RSW-2-50 RoofSeal White: Much like the AlumiBond, RoofSeal uses patented technology to ensure years of use and abuse. It can be used with various RV roof types, such as EPDM, TPO, hypalon, most PVC, modified and all metal. The elongation factor exceeds standards at 700%, making it able to expand and contract for ensured durability in any environment. 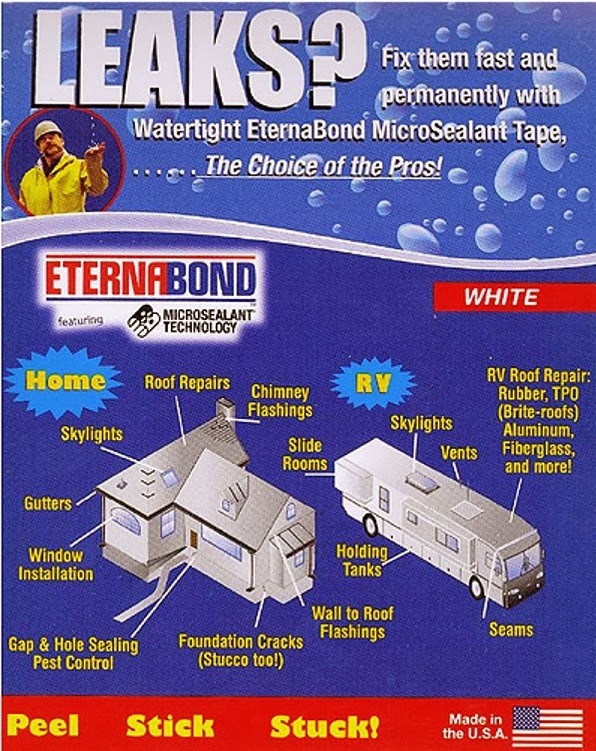 Eternabond UVW-4-5CS Micro Sealant Leak Repair Kit: This leak repair kit uses a one-step repair process that will have your RV dry in no time. Using patented adhesive technology found in all Eternabond products, you can rest assured leaks repaired with this kit won't return. For more great RV accessories and products, be sure to visit RV Upgrades.com. Our experienced and knowledgeable staff is available to answer any questions you have about outfitting your RV with the highest quality parts and accessories on the market. Please contact us for more information.